You did what?! Are you out of your (censored) mind?! The answer is yes, but before I explain what George and I did, a small explanation is in order. In the run up to this trip, information had been spreading across the web indicating that Ratanga Junction was to close around the end of May 2005, as the land had been sold off for other development. To be fair, the coaster roster at Ratanga Junction was not something I would normally have made the effort for; three Vekomas, all of which were clones of models elsewhere in the world. However, there was just one other park within a two thousand mile radius, Gold Reef City, as well as one other small coaster at Chariots Entertainment World. A coaster riding trip to South Africa would be harder to justify once Ratanga Junction was gone. The biggest problem with trying to go was holiday time. There was absolutely no way I could justify taking as much time off as would be needed for such a trip. Maybe a day or two would be okay, but any longer than that would be totally out of the question. Having done the research, though, I thought it might be amusing to send the details to a few people. I wasn't even remotely serious when I suggested to George that we consider doing a trip over a long weekend. I was somewhat taken aback when my e-mail received a positive response. Nobody in their right mind would ever travel over six thousand miles, in each direction no less, for such a trip. Eleven hour overnight flights in each direction, a connection flight between Cape Town and Johannesburg, and a journey directly into work from the airport on the Monday morning all add up to being a totally crazy thing to do. Not to mention the cost! The flight from London Heathrow to Cape Town was uneventful. South African Airways has video on demand, which might have threatened to keep me awake all night, but for whatever reason the system in my seat was in an advanced stage of non-functionality, so for me at least this wasn't a problem. Noise cancelling headphones combined with very effective ear plugs meant that I was able to get something approaching a decent sleep even in the cramped quarters of an aircraft seat. The food was pretty good as airline catering goes, and by the time we landed, just before ten in the morning, I actually felt reasonably human. 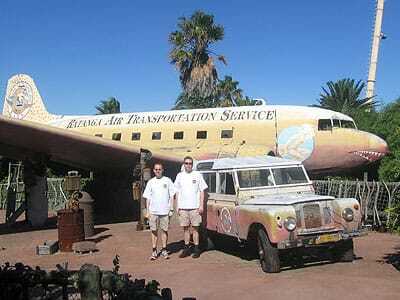 Ratanga Junction is a relatively short drive from the airport. This was my first opportunity in about three years to take the wheel of a right hand drive car. The gearbox felt like someone had used this vehicle to learn to drive, but it was still functional, and driving on the correct side of the road came back to me quickly enough. Nonetheless, the drive was still an interesting experience, largely because the drivers in Cape Town make the French and Italians seem sedate. The rules of the road did not seem to apply; among the more interesting manouvres I observed was a car making a U-turn on a motorway by driving across the middle enbankment. Following the signs for the park led me into an completely empty car park. The top of the Cobra was visible from where we were, but no staff anywhere in sight. This gave rise to the first moment of horror on the trip; was the park closed? Had we come all this way for nothing? I had made contact with the park by e-mail a few weeks before to confirm opening hours, but things didn't look very active. Fortunately, the main entrance to the park turned out to be around the corner, and though this car park was largely empty too, there were a few vehicles present. After taking a few photographs in front of the entrance, we purchased two full ride tickets, at R100 apiece (approximately €12). Moments later, we entered what turned out to be my one hundredth theme park. The first thing to hit me as we walked into the park was the detail of the landscaping and theming. There are a small number of parks around the world that go above and beyond to make their parks look as good as possible, and Ratanga clearly fit into this category. More than anything else I was reminded of Terra Mítica, albeit with a more temperate climate. At the same time, however, the park did show signs that its days were numbered. The few cars that we had seen in the car park must have belonged to staff, as there were almost no guests in the park; we found out later that a total of one hundred and twelve people had passed through the turnstiles during the day. Nevertheless, despite the attendance, all bar one of the rides was running (are you listening, Six Flags?) and the one that was closed, the Tarantula top spin, had scaffolding against it. Rather than distribute park maps to guests, Ratanga Junction had large format maps located in strategic locations around the park. The only problem with this otherwise cunning plan is that, for some strange reason, there wasn't one anywhere near the entrance. Nevertheless, there was only one main path from the gate, so we followed it. In due course, we encountered a bridge from which we caught a first view of the smallest of the three coasters in the park, the Bushwhacker (#393). Most regular readers here will be familiar with the layout, it being one of fifteen operating installations of the 335 metre Vekoma Junior Coaster. This version crashes through the middle of a building but is otherwise the same as the other models I've ridden. Though nominally a junior coaster, this design is easily tall enough to be considered a family ride. The ride operator allowed us to remain in the train for three circuits, and was happy to allow me to use my camera on board. This privilege was much appreciated, as it allowed me to get a superb picture of the largest coaster in the park, Cobra (#394). The standard model SLC is found in twenty four parks around the world. The extended version, featuring an extra helix, is a great deal more rare, with only five installations including this one. The queue line travels through an exhibit featuring more than a dozen live snakes, and gets very close to the ride itself. Unfortunately, the theming is the best bit of the ride. On the plus side, riders are only bashed in the head about three or four times, and are punched in the stomach by the restraints on no more than five or six occasions. It could have been much worse. In ranking South African coasters, it seems fair to put Cobra in 9th place. Out of nine. The ride exit was through a merchandise shop. The Cobra shirt was oddly unimaginative with no picture of the ride or mention of the park name. The only shirt we could find with any mention of Ratanga Junction was a plain white one with a small logo in the corner. The park staff, on the other hand, had a jumper with the logo printed in full size. We enquired if these might be available due to the imminent demise of the park, but apparently there were none left, so we each purchased one of the shirts instead. Without question the most impressive ride in the whole park turned out to be the Monkey Falls log flume. Many parks around the world have drab and uninteresting flume rides, often with a lift at the start, a meandering course, and a medium to large drop at one end. Monkey Falls has the meandering course, but it also has some surprises; one of the smaller drops may have been borrowed from a coaster, and the final drop could have been recycled from a giant splash, as riders end up very wet indeed. The third and final coaster in the park was the Diamond Devil Run (#395), a Vekoma-built mine train. This is the same model ride as that at Walibi Belgium, though the track colour and the theming is different. With a total ride time of three minutes, it is by far the longest coaster in the park, although to be fair about half that time is spent on the two lift hills. Only one train was in use due to the numbers in the park, but even still the ride was a walk-on, once you had covered the five minute walk that was the queue line. This brings me to another point: Ratanga Junction was clearly designed for large crowds. All of the major rides had a very large queueing area. Unlike many other parks, these were not just so-called "cattle-pens"; rather, the paths wound in and around the attractions, helping to build excitement for those waiting, and providing excellent photo angles. With such design effort going into the park, one has to ask the question; how did they get it so wrong? Why should such a park, just seven years old, be closing to make way for a shopping centre? Like the log flume, the Crocodile Gorge rapids ride was one of the most impressive examples of the genre I have ever seen. 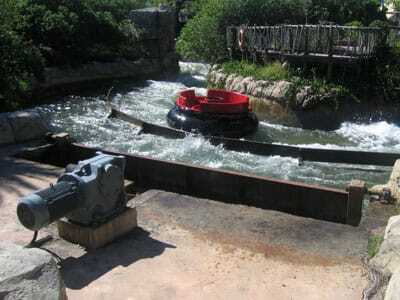 There are a number of places on the ride where spectators can see the pumping equipment in operation, with cameras ready to catch the splashes of water as they land right in the boats. There are other effects too, including one where the last remaining dry passengers get completely soaked as the boats pass directly under a waterfall. In the planning of this trip, both of us had failed to anticipate how good the weather would be, and neither of us had brought sun block with us. We enquired at one of the shops, and were told that nowhere in the park sold anything suitable, which was quite surprising given an evident sponsorship deal with a vendor of skin care products! Rather than risk making our sun burn any worse than it was already, we decided to call it a day, though not before grabbing one more ride on both Diamond Devil Run and Bushwhacker. Even though we will probably never have another chance to ride it, both of us decided that it wasn't worth riding Cobra again. Though we got lost on the way back to Cape Town Airport, we still arrived four hours early for our flight. The airport terminal was absolutely jam packed with people. We already had boarding cards for our flight, courtesy of the staff at Heathrow, so rather than try to switch to an earlier one we just went to get food instead. It is often interesting to look at the various airlines in foreign airports, as there are usually liveries you don't see at home. In Cape Town, there were a number of aircraft parked below the restaurant window with a positively hideous colour scheme that turned out to be for the local low-fare airline, Kulula. Their prices between Cape Town and Johannesburg put South African Airways to shame, and should definitely be considered by anyone planning to travel around South Africa. Just a word of warning; the text on their web site seems to have been written by someone under the influence of a similar substance to that taken by the designer of their aircraft colour scheme. Our flight took off late. We had a very interesting conversation on board with a software engineer from Johannesburg, who couldn't quite believe what we were doing but thought it very amusing nonetheless. We exchanged our own rants about prices for broadband internet access, which if anything seem to be even more outrageous in South Africa relative to home. A cursory glance at the web site he pointed us to indicates that broadband problems are the same everywhere in the world! When we landed, we made our way directly to the car rental office, and although we were the only people there, it still took nearly an hour to get a vehicle. This turned out to be the same model as the one we'd driven in the morning, albeit with a much better clutch pedal. Consider for a moment the state we were in as we drove away from the airport. Both of us had left home for the office some thirty six hours previously, and had a few hours at most of broken sleep on an aircraft some sixteen hours previously. The most sensible thing to do in this situation would of course have been to go directly to our hotel. However, there were two places we wanted to visit in Johannesburg; the Caesars casino resort, which is home to Chariots Entertainment World, and Gold Reef City. Between both locations were a total of five roller coasters, and the last of these would, with luck, be my 400th. 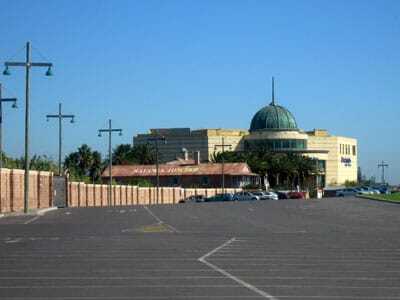 Gold Reef City was home to two worthy candidates for this landmark; Chariots was home to just one small indoor ride. Gold Reef City was about twenty miles from the airport, but Chariots was no more than a five minute drive. For these reasons, we decided to make a brief stop at Chariots to get that credit out of the way, with a longer stop on the way back to the airport on Sunday afternoon. Neither of us had ever ridden a new coaster for the first time at 12:15am, but the imaginatively named Roller Coaster (#396) woke us right up again. Much to my surprise, the twenty rand per ride Vekoma-built coaster turned out to be absolutely superb, and easily the best coaster of the day. An abundance of airtime is tied in with a number of near misses both with building walls and assorted arcade machines on the floor below the ride. My only criticism is nothing to do with the ride itself; it is simply impossible to photograph well! It has taken a long time for Vekoma to figure out how to build smooth rides, but those using the new Schwarzkopf-like track design, as seen on Okidoki at Bobbejaanland, approach the quality of B&M. Casino operators in Las Vegas could learn a lot from their South African cousins, as Roller Coaster is definitely better than all the mediocre rides in the desert. Due to the time, we didn't stay for more than one circuit. The drive to Gold Reef City was uneventful, with us arriving just after 1:00am. Unusually, the hotel for Gold Reef City is actually inside the park itself. Half a dozen security officers were at the gate, and checked our names off a list before admitting us. Check-in went smoothly, and on arrival in the room It took me less than ten minutes to fall asleep.